Hello, my name is Mitzy and this is my very own website. 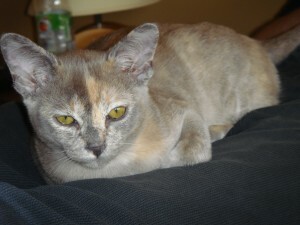 I am a pedigree blue tortie Burmese. This photo is of me! I get up to all sorts of mischief! My favourite toy is a little tigger. I like to throw it around and unfortunately I have been a bit rough with it and he has had a leg amputation! I carry it around the house and hide it in all sorts of places. Here I am, doing what I do best! About to go to sleep! 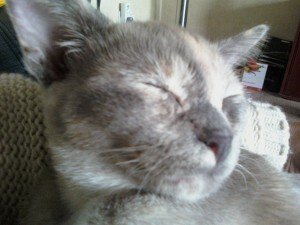 I love sleeping – I spend most of my day asleep! I only wake up to have something to eat and play with the humans until they get tired. Here I am with one of my favourite toys. It’s a toy nemo. I’ve had him since I was 12 weeks old and I came to live here. 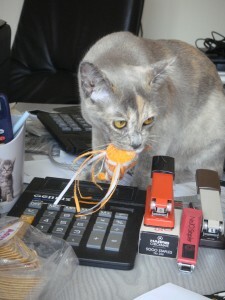 He’s looking a bit worn now but I have got another toy to play with instead – a small tigger!